The lumbar plexus block targets three main nerves supplying the lower limb which arise from the lumbar plexus. This block is also called a psoas compartment block. The three nerves which are targeted are the femoral, obturator and lateral femoral cutaneous nerve. The lumbar plexus is formed from the anterior primary rami of L1 – 4. In 50% of subjects it receives a contribution from T12. The plexus gives rise to 3 small nerves (iliohypogastric, ilioinguinal and genitofemoral) and 3 larger ones (femoral, obturator and lateral femoral cutaneous nerve or LFCN) which are responsible for the nerve supply of the lower limb. The 3 larger nerves pierce the body of psoas major. The LFCN and femoral nerve emerge on the lateral border of psoas major and pass under the inguinal ligament. The obturator nerve leaves on the medial border of psoas muscle. The following picture is from Gray's anatomy taken from wikimedia commons. This picture shows on the left side of the body the relations of the nerve with the psoas muscle and inguinal ligament. On right side the psoas and inguinal ligament are removed. The nerves lie in the posterior 1/3rd of the psoas muscle. 1. The main indication is surgery on hip joint (e.g. hip replacement, surgery for fracture neck of femur). 1. 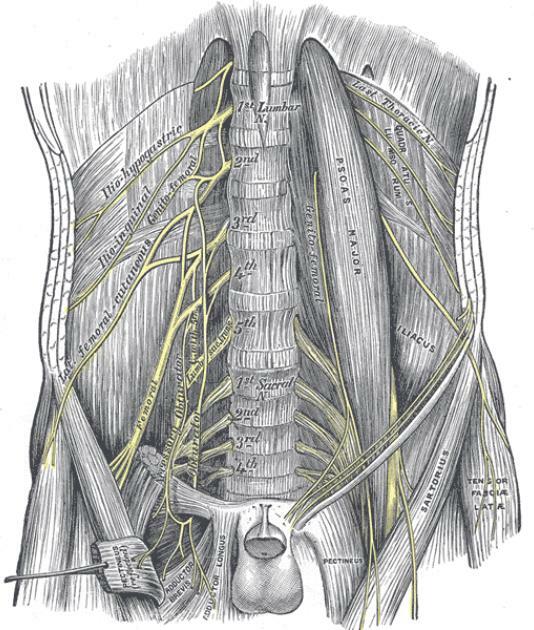 The lumbar plexus block is associated with some of the most life threatening complications like total spinal anaesthesia, local anaesthetic toxicity and damage to retroperitoneal structures. Therefore this block should not be done without a proper indication. There are other ways to provide pain relief to patients undergoing hip replacement surgery. 2. The lumbar plexus block is better at providing complete blockade of the lumbar plexus compared to a femoral three in one block and thus is a very good block for the elderly population with fracture neck of femur. Complete blockade provided by a lumbar plexus block in this population reduces opioid requirement dramaticaly in the perioperative period. 3. Good knowledge of anatomy is very important with all blocks BUT this is one of the blocks where not knowing the anatomy can have deadly consequences. 4. Never use a needle longer than 10 cm. 5. If the going gets weird then stop- Tew's law i.e. if you are unable to locate the lumbar plexus with reasonable effort, stop. Do not persists as you are likely to do serious damage. 2. Insulated stimulating needle (I use 100 mm stimulating needle). Unlike the peripheral nerves or the brachial plexus, it is very difficult to see the lumbar plexus in all patients using ultrasound. One of the ways we use ultrasound is to assist the nerve stimulator guided lumbar plexus block. Using anatomical landmarks (as described by Capdevilla et al) the insertion point of the needle is determined and marked as shown in the animation below. Once the insertion point is marked the ultrasound is used to find out the accuracy of the insertion point. 1. Level of intervertebral interspace the insertion point corresponds to. 2. Is it overlying the transverse process of the vertebra? 3. How deep is the transverse process from the skin? 4. Where is the lower pole of the kidney? 5. How deep is the peritoneum and the bowel from the skin? Once the above has been determined then the lumbar plexus block is done using a nerve stimulator. A 10 cm needle is inserted with no medial (towards spine) or lateral angulation. If the transverse process is encountered then the needle is walked off the transverse process either in cephalad or caudal direction. When the needle is in an ideal position then quadriceps twitches are seen. Local anaesthetic is injected after a sensible threshold current (around 0.5mA) is obtained. Epidural spread of local anaesthetic is seen in around 6% of cases. In the following video Dr Barry Nicholls expresses his views on Lumbar plexus block and his technique of doing it.